This 14 Watt 1 GPM Ultraviolet system combine dual filtration with ultraviolet technology. The system consist of 5 micron pleated sediment filter technology that removes suspended solids, cysts and Giardia, A 10 micron Carbon block filter for removing chlorine, tastes, odors and other chemical contaminants plus the ultra violet stage. The Vertex UV2 system is equipped with standard 9 3/4 cartridge for easy to find replacement. The system includes Long reach Non-Airgap Clean water faucet, feed water connection and shut off valve, tubing , and installation instructions. Easy to replace UV Lamp - slides into quartz tube without breaking fluid seal. This 14 Watt 2 GPM Ultraviolet system consist of Three -Stage filtration plus added ultraviolet stage for maximum protection. 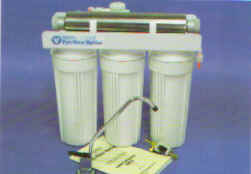 The system uses a 5 micron sediment filter and two 10 micron carbon block filter to remove sediment, chlorine, taste, odor and other contaminants. 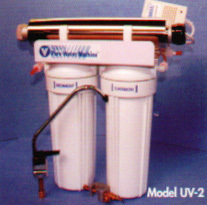 The Vertex UV3 includes a long reach clean water faucet, feed water connection, tubing and installation instructions.